Items 120- out of displayed. 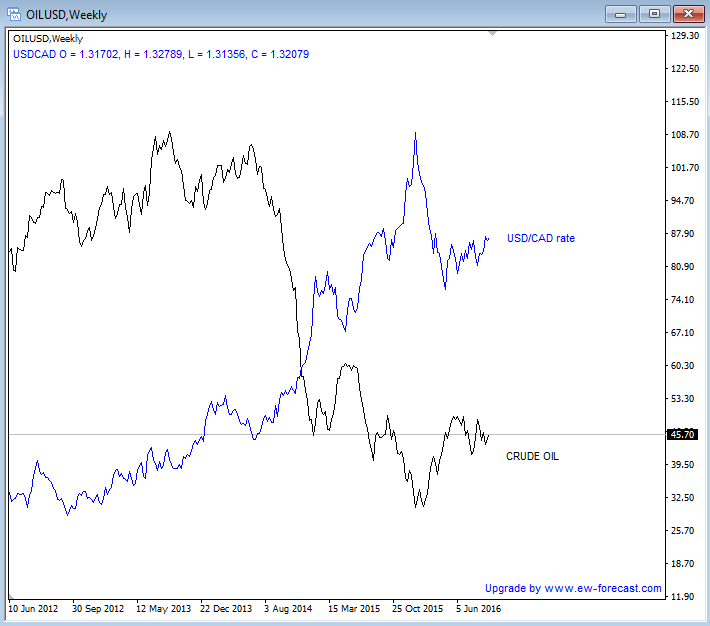 Anyone who is trading crude oil or USD/CAD should be aware of the important correlation between them. We know that if oil price rises then the Canadian economy benefits as they own considerable oil reserves (third only to Venezuela and Saudi Arabia). Furthermore, let’s not forget that the USD will likely drop in value if oil prices rise, and this makes USD/CAD a very interesting pair to trade in connection with energy. So if you are looking for a trade on USD/CAD or crude oil you should be tracking both markets to make sure that your views are matching. If you are looking to short USD/CAD then you want to see higher oil, and vice-versa. Charts don’t lie, so it’s not a bad idea to make a comparison from time to time between oil and USD/CAD, like we do below. In the above chart the negative correlation is clearly visible, and what we really like is the strong decline on USD/CAD and matching bounce on oil at the start of 2016. Technically speaking it looks like a strong first leg that belongs to a bigger structure. 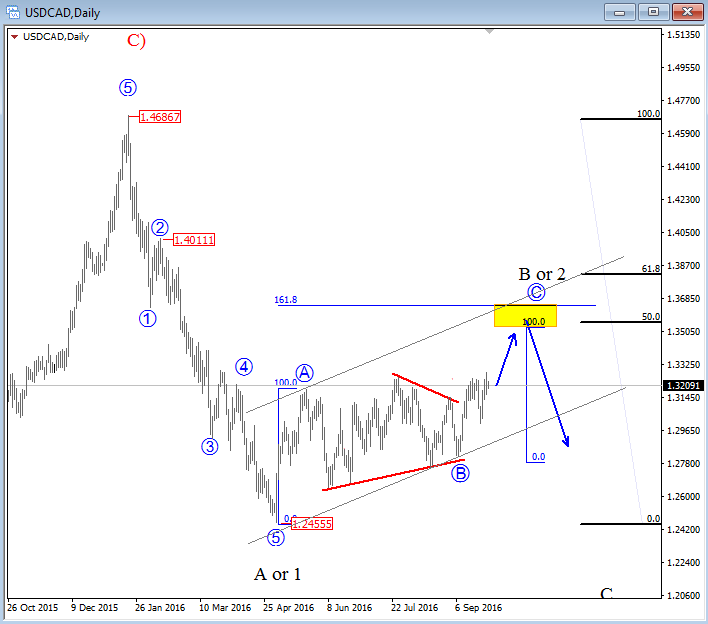 From an Elliott Wave perspective (which is my primary tool for analyzing markets) USDCAD has five clear waves of decline from 1.4680 to 1.2455. In Elliott Wave terms that’s called an impulsive wave which is strong and most important evidence for a change in trend; in our case from bullish to bearish. It’s also very important to know that impulses are part of a bigger structure, so even if the decline from that 1.4680 high is going to be just one big correction you still need more downside. Corrections are always structured by a minimum of three waves such as A-B-C. That said, we think that the current recovery from 1.2455 is temporary, labeled as wave B or 2, especially if we consider a triangle in the middle of a current three wave bounce from 1.2455. 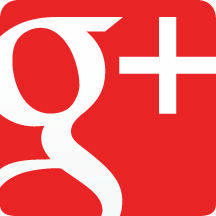 Why is the formation of a triangle important, you ask? Because they never occur in wave two position of an impulse, but they will normally show up prior to the final wave within a larger sequence. In that case the current blue wave C (circled) is our final wave of a larger 3-leg structure so a bearish reversal may not be far away. Technically there is room for 1.3500-1.3700 to complete a recovery based on Fibonacci levels. 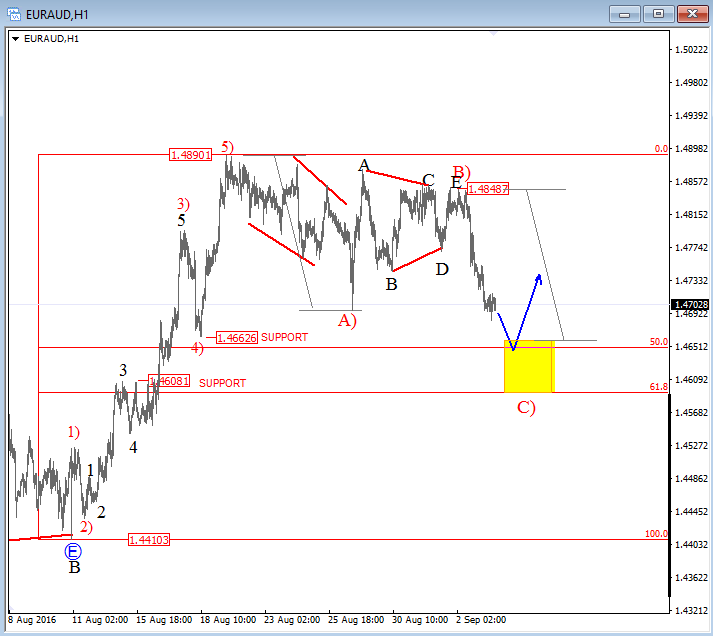 Having said that, we think that the upside on USD/CAD will be limited which means that traders should be prepared for a bearish turn in the weeks ahead. This is also supported by a bearish Head and Shoulders pattern that may currently be in its late stages (weekly chart). H&S patterns are one of the most powerful technical formations and an old-school approach when it comes to identifying topping or bottoming formations. So, going back to the OIL/CAD correlation we can assume that oil should rise if our bearish analysis on USD/CAD proves to be correct. 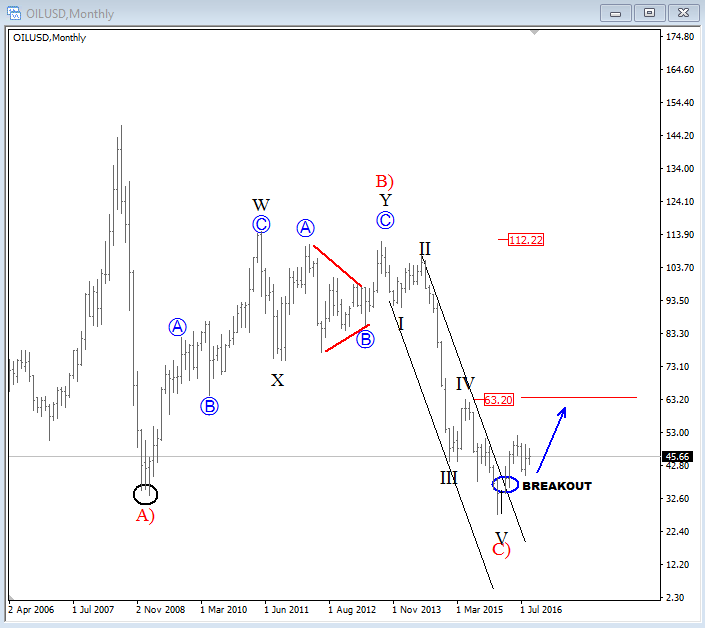 On the crude oil monthly chart we can observe a big three wave drop from the 2008 high that should lead to a reversal (i.e. 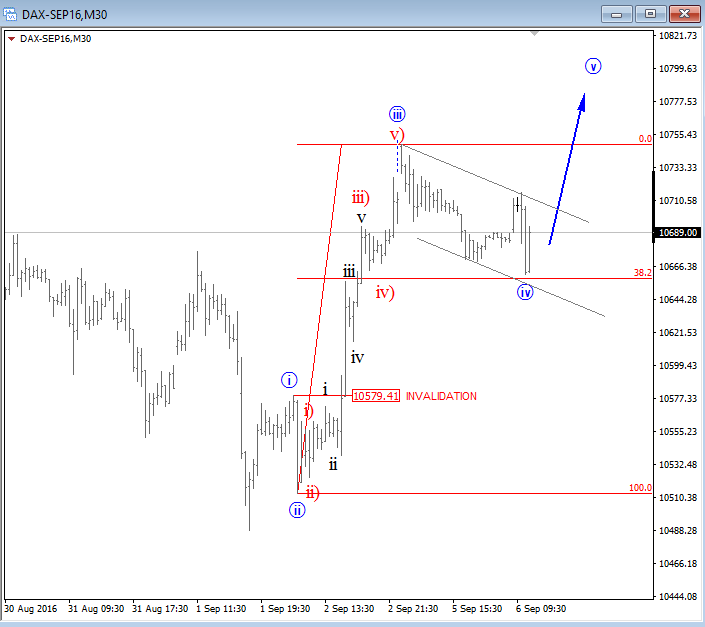 continuation of the main trend), but as always we need to focus on minimum expectations only. So technically the price may go back to 63.20 after a break out of the downward channel from 112.00 and this is supported by a bullish (inverse) H&S pattern on the weekly chart. 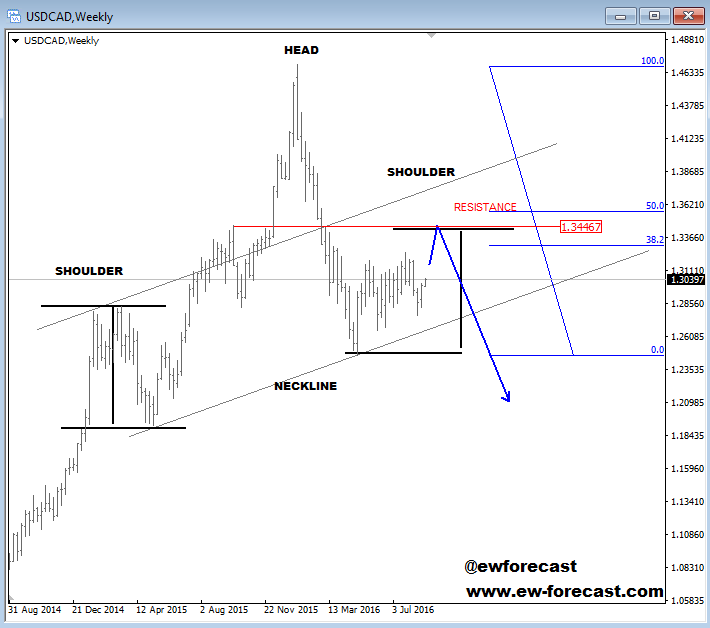 Considering the charts depicted above I clearly expect higher prices on Crude oil, while at the same time I expect USDCAD to resume its downtrend later this year. Here we can see how nicely German DAX played out from a technical perspective. Index made a nice set-back into blue wave iv and later continued higher in wave five, close to 10800 region from where sellers caused a strong drop to 10570 area. The question is the following; "Did market reacted how it did because of ECB today", or, "Is it because of technicals and market psychology? Make your own conclusion, but if you are looking at charts then clearly techical view should matter a lot with your trading decision. 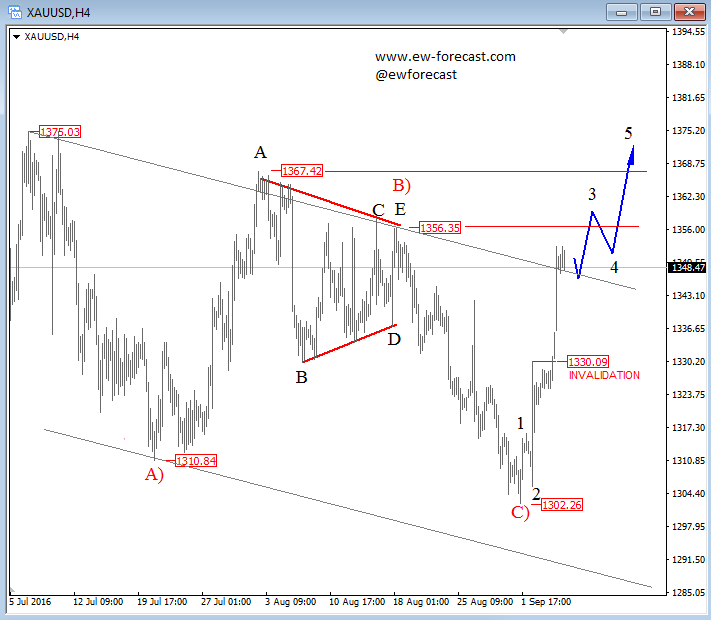 An updated chart on Gold shows a deep three wave contra-trend move; an A)-B)-C) set-back that now clearly appears finished after another bullish push to around 1350 level in the last 24 hours. Whole leg up from 1302 low is very strong and much sharper than any bearish leg within a pullback from 1375 highs. As such, we think that money is on the bullish side now and that market will continue even higher after any short-term retracement which should represent a minor correction within uptrend. Next solid set-back will be a black wave 4 that may show up from around 1356-1364 short-term resistance levels. 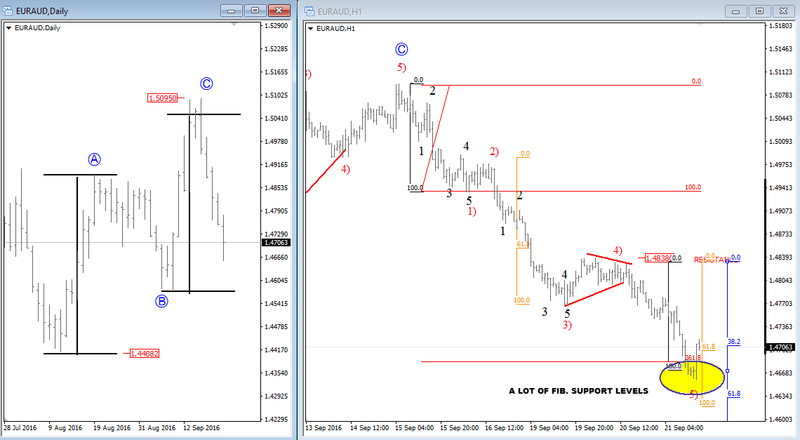 We have talked about a triangle on EURAUD last week and highlighted 1.4848 as an important level that must be broken for a bullish case. This did not happen so obviously it was a triangle placed in wave B) and not wave four as discussed on twitter. Price is much lower now following Friday's disappointment on NFP figures, but despite new leg down we still see decline from 1.4890 as temporary and corrective movement. 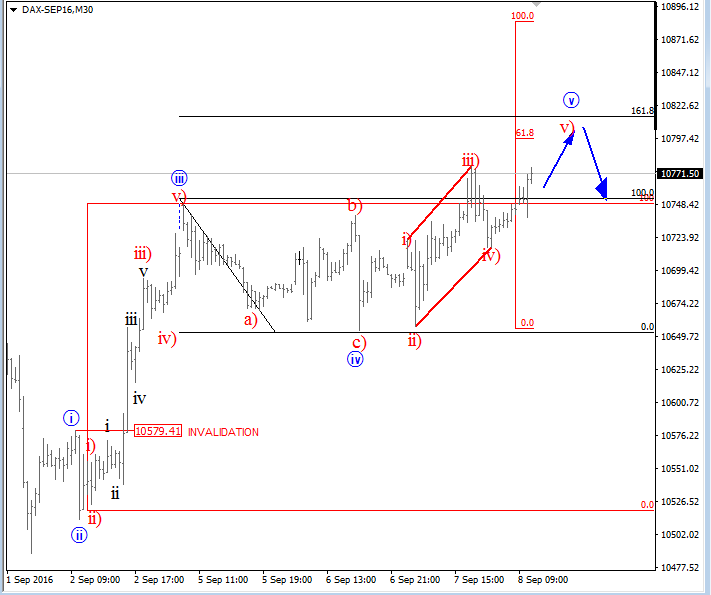 It's an A)-B)-C) against previous five wave rise, so we think that sooner or later new swing low will occur. Based on Fibonacci projections this may happens somewhere between1.4600 and 1.4660. 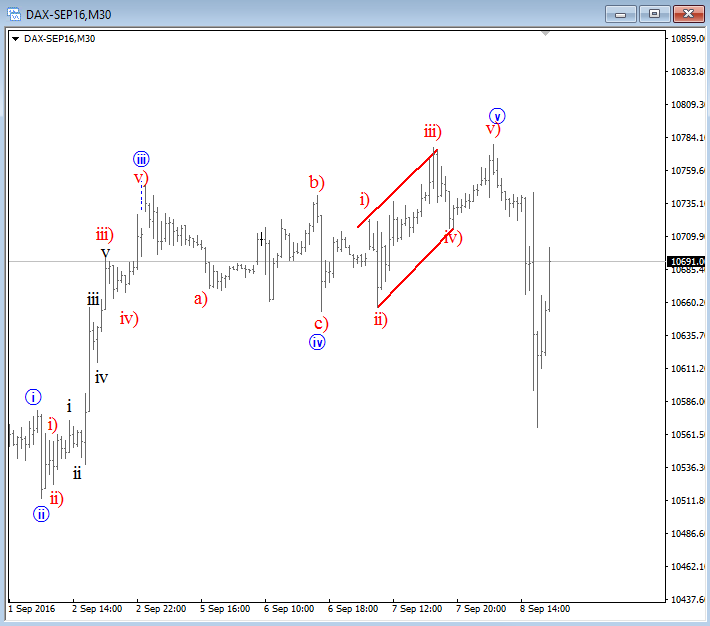 A five wave bounce from there (on lower time frame) would be very interesting to join the trend. 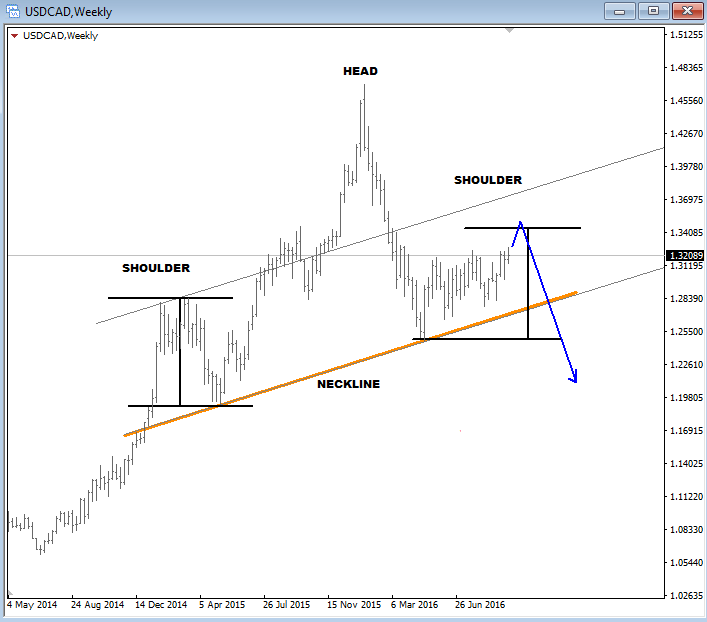 On USDCAD we are looking at a big bearish headed and shoulders pattern with more upside possible in September, towards 1.3440 resistance area where upside can be limited as we think that this pair formed an important top at 1.4700 mark in January of this year. 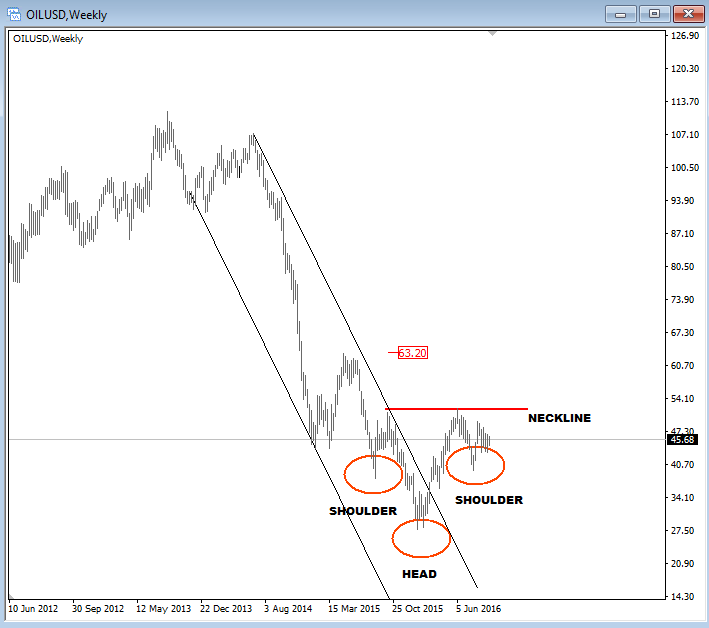 You know what is good thing about old school analysis, such as H&S pattern? That you can apply it very well with Elliott Waves. The question is, do you see the EW pattern? It's pretty clear to me; wave A down, now wave B up, so wave C down yet to come. In our new video analysis we will talk about Crude oil which may see higher prices based on Elliott Wave, Head and Shoulders pattern and Moving Averages.